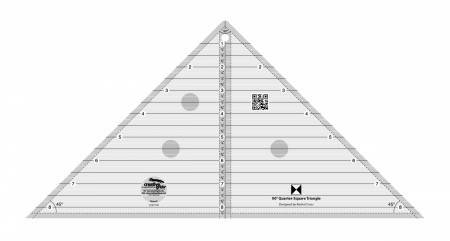 This 90-degree triangle cuts quarter triangles up to a finished size of 8 inches. Since the tip is trimmed, all squares and triangles can be cut from the same strip of fabric. Sew four together to create quarter-square triangles up to a finished size of 16 inches. A 1/4 inch dashed line is printed on each side of the center vertical line so you can cut 45 degree triangles that include the seam allowance. A dashed 1/4 inch seam allowance is printed around the entire edge of the ruler. Total Size - 8-1/2in x 17in.